Well, old buddy Jackson is the first taker on the Will Draw for Links offer. I swear I am not trying to become a dog portraitist here, it's just that Jackson, like Finnegan, is going through a rough spell with his health. There's nothing wrong with being a portraitist, dog or otherwise, but there is a different set of expectations that go along with capturing a likeness or someone's character. I'm enjoying the process of sketching for the first time in a while, and I like the freedom to diverge from my subject. But a couple of portraits won't hurt. No problem. The card is in the mail, winging its way to you one of these days. 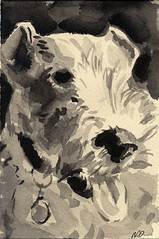 You may not be looking to become a dog portaitist, but the Jx and the boston terrier and many of pappy's pieces are really good, especially given the volume of stuff you are producing. And, while the Jx is a fairly traditional pose, the others offer a quirky, and often amusing, point of view . . .